Great Historical Resource. 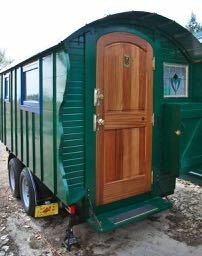 If you are just becoming familiar with vardo-style caravans from the 19th century, this is a good starting point. Gypsy Vans by Roth. Beautiful traditional waggons with loads of information about types and styles. Amazing stuff here. Solid, towable vardos from Windy Smithy. Ingham & Fallon, restoration, new and used. The images alone make this page worthwhile. As the logo says “GYPSY WAGONS BUILT TO ORDER…” or you can buy the plans and get to work yourself. Wagon by Nick Dow. He’s a real artist with the paintbrush as well. Daphne inspires many modern takes on the old caravan. Many great ideas here and classes offered. Rachel has created some nice SCA (reenactor) wagons and created an excellent LINKS page. Plan to spend some time on this website. Anvil Wagon Works in Livingston, Montana makes all types of traditional Chuckwagons, Sheepwagons, and Buggies. Lot’s of great photos inside and out. The logo above links to their Sheep Wagon page but there is so much more here. These are erious craftsmen of all things traditional Wagon and Wheel related. The Lazy AA Guest Ranch and Builders of towable Woolywagons. Idaho Sheep Camp. This is the interior of just one of their many featured wagons. You can’t be more authentic than this. I want one! Pages of images to inspire the builder of tiny homes. Old Western Wagons are builders of Sheep Wagons, Vardos, Freight Wagons, and other horse-drawn vehicles. Located in Seattle, Washington. Engel’s Coach Shop of Joliet, Montana. Master Wheelwright and makers of horse-drawn vehicles. Plankbridge Shepherd Huts from Dorset, England. Traditional huts, not for long distance travel but fine for short moves. Nice designs. Ranch Willow Wagon Co. builds and restores wagons to the highest quality standards. Company owner Lynn Sedar has been in the wagon business for over 20 years and is also an acclaimed artist, design consultant and furniture designer. Wagons designed by Ranch Willow Wagon Co. are the ultimate blend of history and art. Blackdown Shepherd Huts. Handcrafted in Somerset, England. Posh and spiffy little cabins with lots of style. Everything you need to know about historic Shepherd Huts. THE NEW GYPSY CARAVAN. Looking for an inexpensive plan to build your own car-towed caravan? This is the answer. Timothy Lemke even has a book with full plans. And yet another in a growing world of home-builder/travelers: Puyuria Problems. It is a blog documenting their building of their little dream vardo. Click the image below to see their progress. In French. The website contains some good old images as well as information about various types of travelers’ wagons (a.k.a. Roulottes). Tumbleweed Houses have become iconic in the Tiny House Movement. If you want the ultimate in minimalism and a well designed living space, you really cannot do better than this. Thanks. I’ll have a look at it this morning. Thanks. I tried the link but it didn’t work. I think this one does: http://www.travellerhomes.co.uk/?s=62 (at least it did for me). Great stuff. looked at both , mine lept right into a slideshow, yours one level above, all in all , one and the same. Thanks! Come by often. Comments are appreciated. Thought you might be interested. There weren’t that many sites that explicitly gave instructions on how to build a vardo, we started our own distilling from various sources. Thanks! There used to be NONE on the web. All of us contributing makes a big difference. I believe you’d once showed the “walking house”. Yes. N55 has done some neat stuff over the years. Great! I haven’t been to his site in a while. Wish there were more info about them all. Thanks for the comment Donna. I wish you all the best of luck. James, Thanks for the message. All this is covered in the Comments section either HERE or HERE but since they may be hard to find I’ll answer as best I can. The bed does slide out about 10 inches making a tight double futon width bed. It is an oak plank with a side to hold the mattress in place. The rest of the mattress (since it is just a futon) just bends up against the back wall to form a sort of couch but still leaves enough room for one person to sleep alone. The stove pipe is just single wall passing through a wall thimble that I think is visible in some of the photos HERE. I am really working to re-write this all to cover the 200+ questions I have received so far so feel free to contact me again if something isn’t clear. Good luck!